Happy New Year! 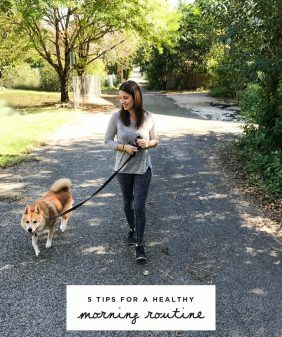 This is usually the post where I would list some sort of New Year’s Resolution… but today instead of talking about how I wish I would floss more or how I’m going to hit the gym more regularly (spoiler alert: I’m not), I thought I’d share some of the small things that make me feel happy and healthy throughout ANY week, new year’s or not. 1. Start the day on a healthy note. I find that when I have something healthy in the morning it sets me up to make mindful food choices throughout the day. 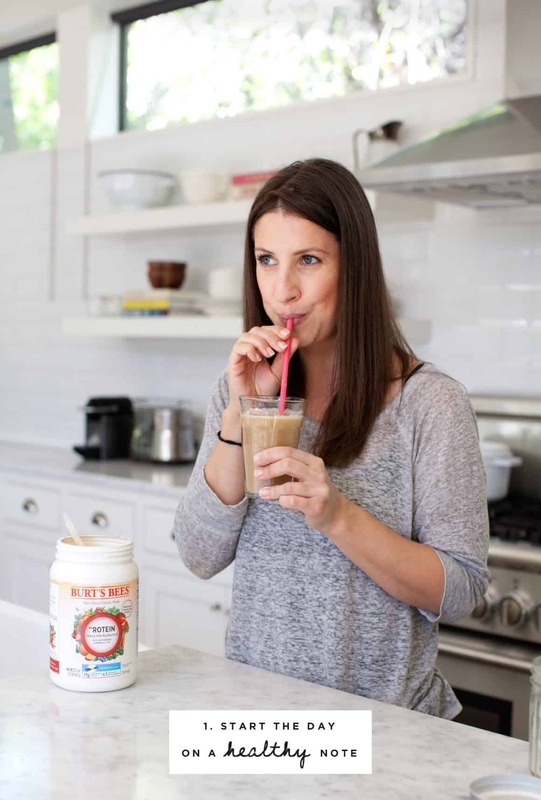 I often make smoothies but right now I’m loving Burt’s Bees™ new Protein + Healthy Radiance Shake. It’s especially wonderful for those mornings when I need something quick and don’t want to make a fruity mess out of the kitchen. I’ve been a fan of their products for years, (I swear by their lip balm!). 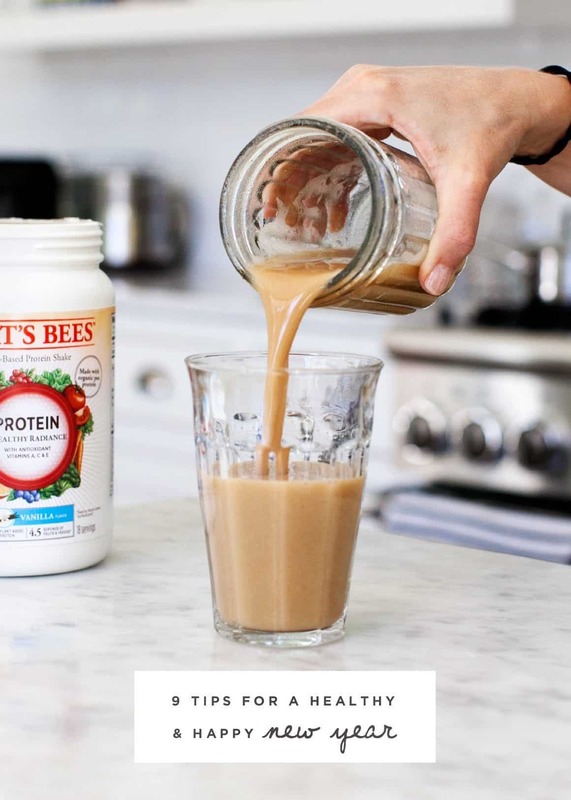 This protein powder is packed with everything necessary to fuel up in the morning: 15 grams of plant-based protein, 4.5 servings of fruits & veggies. * It’s made with ingredients like pea protein, flaxseed and sunflower seeds. It’s dairy-free, gluten free, and it’s naturally sweetened with honey, monkfruit extract, and Stevia leaf extract. 2. Find exercise in everyday routine. It’s the new year and I’m probably the only person who just quit the gym! My favorite way to “work out” is to find ways to move within my daily activities. Jack and I like to take walks around our city or hike to the farmers market on Saturdays. Of course these walks are weather permitting – when I lived in Chicago, I’d take the stairs up to class instead of waiting for the elevator. This is the easiest way to incorporate more vegetables into your life. It’ll also get you out of your cooking rut because you’ll be forced to try new produce. Don’t be scared when you get kohlrabi – I’ve got you covered. 4. Prep ahead for weekday lunches. 5. Set aside time to be creative. Over the years, I’ve learned that I do my best work during the late morning. You might be a late-night person, but my mind is the most clear during the morning hours of the day. I use this time to get my most important work done. Mindless photo-editing, emails, and other busy-work tasks can wait until later, but I try to tackle my more creative projects at this time with my computer’s internet browser closed. These projects may include a book proposal, a plan for next month’s recipes, or really just anything that requires new fresh ideas. No-Bake Almond Oatmeal Bites, chopped vegetables with hummus, or tamari roasted almonds (find them in most bulk sections), are a few of my favorites. I’m pretty sure no one else’s new year’s guide involves eating out more. I obviously love to cook but when I get burnt out, I like to try new restaurants to collect new recipe inspiration. 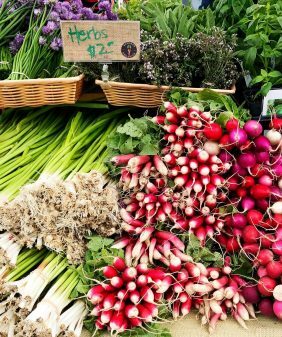 In Austin, some of my healthy favorites are: The Steeping Room, Snap Kitchen, True Food Kitchen, Piknik, and Casa De Luz. 8. Take a break for fresh air in the afternoon. Since I work from home, it’s easy to plunk myself in front of the computer without getting up for hours. I try to make a point to get up and stretch or move around every hour, but I also love to get up and out in the afternoon. Even a 10 minute walk in the neighborhood helps me clear my head and make room for new ideas. When life gets stressful, I love to calm down by making soup. Chopping vegetables is so cathartic. Simmering and tasting soup as it cooks is comforting and cozy, and the finished product is so healthy and nourishing. Next time life gets hard, drop that chocolate bar and try making soup! These are my little New Years tips, what are yours? That Burt’s Bees protein sounds amazing, I had no idea they did more stuff than cosmetics! Woww, I’d like to be so organized in my life;-) Thanks for sharing!! Hi Mary – aww! She’s a Shiba-ish mix of some sort but our other dog is all Shiba. What great ideas! Especially love the soup idea! I love chopping veggies!! Thanks for the weekday lunch ideas: always a challenge! just ordered some protein powder to try! There is a smaller pack with a couple packets of chocolate and vanilla to try both 🙂 Love your blog Jeanine! thanks Sarah, I hope you enjoy! Can you talk a bit about the flavor/aftertaste of the protein powder? I’ve found that most I’ve tried have this fake-sweet taste that I don’t care for. What about this one? Thanks! Hi Kristin, it’s not overly sweet and I don’t notice a fake aftertaste. I find the texture to be similar to Vega one. Hope that helps! Thanks for sharing your helpfull tips. Thanks for the tips and happy new year! Love these tips! I’m visiting Austin in March after a while, so definitely marking the places you mentioned. thank you for all of this! Wonderful healthy list, a good “go to” for the year, appreciate your putting this together, thank you!